Facebook provides highly targeted advertising opportunities, allowing the advertisers to deliver ads specific to a web visitor”s demographics. This goes beyond geographic information, and includes the web visitor’s likes, dislikes, and interests. I was recently shown a guerilla marketing campaign on Facebook, and thought that it was worthy of further discussion. Here is the ad the was displayed. Notice how it doesn’t overtly “sell” anything, but rather uses both photos and text to pique the reader’s interest. The ad offers to deliver value to reader, if the reader simply clicks on the ad to read more. The reader is just a click away from learning how to go from a pale, beer drinking geek to a tanned, “ripped”, stud … in just four weeks. Naturally, I clicked on the ad. The ad linked to a website. In this case, the ad linked to a weight loss diary website. Notice that the URL hides two variables, presumably allowing the online marketer to track the ad and the keywords that drove the click. This is a technique that is used in dynamic landing pages. With dynamic landing pages, the landing page changes based upon variables passed through the URL. Here is the landing page for this campaign. As you can see, this landing page does not look like an ad. The online marketer has used the movie “300” and a personal story in their online marketing efforts. They have focused on delivering value to the user, in the form of a “how-to” guide on getting fit. This includes specific instructions, and more before and after photos. 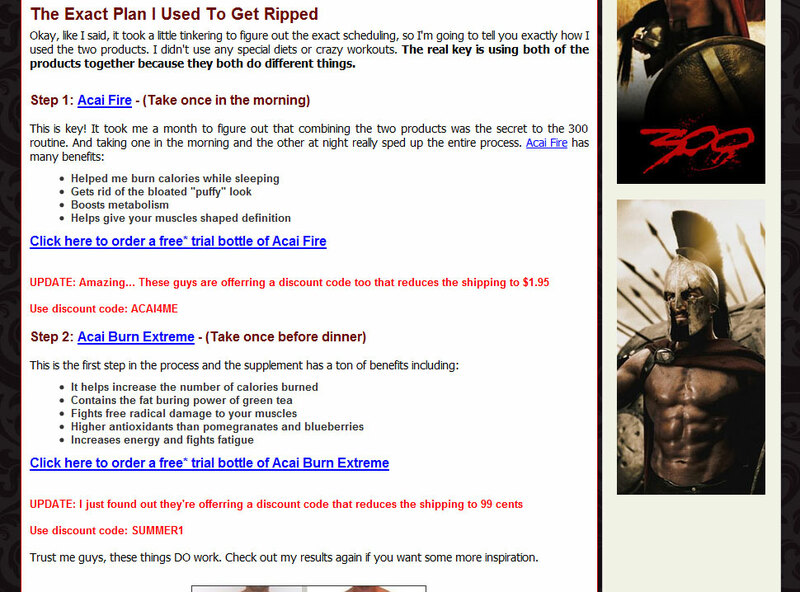 Notice the step by step plan, that suggests that the reader take two products within specific instructions to get a ripped as the characters in the movie “300”. The online marketer offers discounts through the use of discount codes. Discount codes are an effective strategy to encourage the web visitor to take action (by purchasing), and also allow the seller of the product to accurately give the referring website an affiliate commission for the sale of the product. Each coupon code is unique to each affiliate and discount amount. For example, let’s say a seller is offering a 50% commission on the sale of a widget. A discount code of ‘ABC123’ can translated to a 10% discount referred by affiliate Jane Doe, where Jane Doe gets a commission of 40% (50% – 10%). Discount code ‘ACD321’ can translated to a %15 discount referred by affiliate John Smith, where John Smith gets a commission of 35% (50% – 15%). The purchaser is only aware that they are receiving a discount, not that the seller is tracking the sale for the affiliate through the discount code, nor that the affiliate is getting a commission dependent upon the amount of the discount. The transactions are also tracked by affiliate code on the links, so that if the web visitor doesn’t use a discount code, the affiliate still receives a commission. The techniques we’ve discussed here can be used with most any online marketing campaign. Delivering content of value to the reader, creating dynamic content based upon the campaign, tracking transactions using multiple points (discount codes, URLs, etc. ), offering discount codes, etc. are all key techniques in online marketing – especially with regards to guerilla marketing. I recently saw this post from Internet Icon Justine Ezarik, which exemplifies the power of online influence. Justine reaches out to millions of fans through various online channels. Justine is a true online influencer. When she speaks, people listen. Which is why posts like this can be so damaging to a company’s online brand. Actively participating in the online conversation surrounding your corporate brand is more important than ever. This allows you to control the bad (and re-enforce the positive) discussions about your company. There are numerous online tools which make this process manageable, automating the ongoing tasks that can make online brand management arduous.